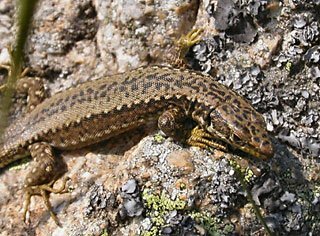 Status: Iberolacerta cyreni is endemic to the central mountain system of Spain, where it is a reasonably common species in several areas. However, its populations are highly fragmented and are threatened by habitat loss, especially due to the construction of ski resorts and roads. It might also be adversely affected in future by climate change. Currently listed as Endangered. An adult pigeon is about 32 cm from beak to tail and 350 gram in weight. Pink pigeons have pale pink plumage on their head, shoulders and underside, along with pink feet and beak. They have dark brown wings, and a broad, reddish-brown tail. They have dark brown eyes surrounded by a ring of red skin. Newly hatched pigeons have sparse, downy-white feathers and closed eyes. 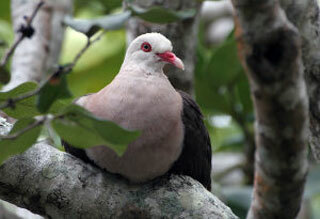 Status: The Pink Pigeon (Nesoenas mayeri) survives in the Black River Gorges of south-west Mauritius and on Ile aux Aigrettes, just off the eastern coast. Although once common, it declined to just 10 wild individuals in 1990. Since then, intensive management has resulted in a spectacular increase. In January 2000, the wild population was 364-375, at four mainland sites plus Ile aux Aigrettes. By the end of 2004, the population was 359-395 indviduals, likely nearer the lower estimate. Severe loss of habitat has been compounded by predation of nests and adults by introduced Crab-eating Macaque Macaca fascicularis, mongoose Herpestes auropunctatus, rats and feral cats. Cyclones destroy nests and accelerate habitat degradation. Disease and late-winter food shortages are also threats. The species is currently listed as Endangered. 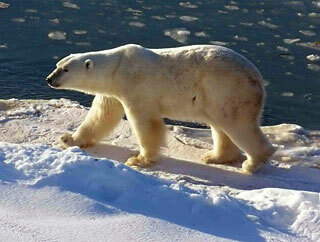 The Polar Bear is the largest existant carnivore species residing on land, twice the weight of a Siberian tiger or lion. Most adult males weigh from 400 to 600 kg (880 to 1300 lb) and exceptionally, up to 800 kg (1750 lb). The Kodiak sub-species of the brown bear, an omnivore, is sometimes as large. The largest polar bear on record was shot at Kotzebue Sound, Alaska in 1960. This male was estimated to weigh about 880 kg (1960 lb). Mounted, it was 3.38 m (143 in) tall. Females are about half the size of males and normally weigh 200 to 300 kg (450 to 650 lb). Adult males measure 2.4 to 2.6 m (95 to 102 in); females, 1.9 to 2.1 m (75 to 83 in). At birth, cubs weigh 600 to 700 g.
Status:The Polar Bear (Ursus maritimus) moved into the threatened categories after being reassessed as Vulnerable for the 2006 Red List. Recent modelling of the trends for sea ice extent, thickness and timing of coverage predicts dramatic reductions in sea ice coverage over the next 50.100 years due to global climate change. It is suspected that there will be a population reduction of at least 30% over the next 45 years as a result of this habitat loss and declining habitat quality. Other threats to the population include pollution, and disturbance from shipping, recreational viewing, oil and gas exploration and development, and potential risk of over-harvesting (as a result of both legal and illegal hunting) in future. 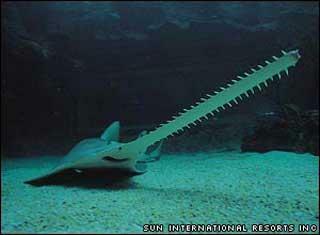 The most eye-catching feature of the sawfish is of course, their saw-like snout; called a rostrum. The rostrum is covered with motion and electro-sensitive pores that allow sawfishes to detect movement and even heartbeats of buried prey in the ocean floor. The rostrum acts like a metal detector as the sawfish hovers over the bottom, looking for hidden food. It has also been used as a digging tool to unearth buried crustaceans. When a suitable prey swims by, the normally lethargic sawfish will spring from the bottom and slash at it furiously with its saw. This generally stuns or injures the prey sufficiently for the sawfish to devour it without much resistance. Sawfishes have also been known to defend themselves with their rostrum, against predators (like sharks) and intruding divers. The "teeth" protruding from the rostrum are not real teeth, but modified scales. Due to the appearance of the fish, sawfishes are sometimes called "Sharks with Swords". The Sri Lanka Frogmouth (Batrachostomus moniliger) is a relatively small frogmouth. The frogmouths are a group of tropical nocturnal birds related to the nightjars. This species is found only in southwest India and Sri Lanka. Its habitat is dense tropical forest. A single white egg is laid in the fork of a tree and incubated by the female at night and the male in the day. The Sri Lanka Frogmouth is about 23cm long. It looks large-headed, and has a large flattened hooked bill and huge frog-like gape. The female is rufous, lightly spotted with white. The male is grey and more heavily spotted. Like other frogmouths, this species rests horizontally on branches during the day, camouflaged by its cryptic plumage. At night, it hunts insects with its large gape. The flight is weak. 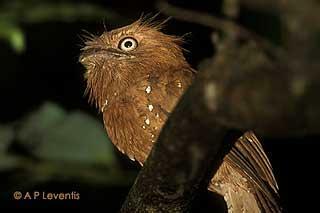 The Sri Lanka Frogmouth is best located at night by its song, which is a loud bubbling laugh. The Giant Salamanders (Cryptobranchidae) are aquatic amphibians found in brooks and ponds in Japan, China and with a similar specimen in the United States. They grow up to 1.8 meters in length, though most individuals found today are considerably smaller. During mating season, these salamanders will travel upstream where, after the fertilization of the eggs, the male will guard them for at least six months. At this point, the offspring will live off their noticeable stored fat until ready to hunt. The giant salamander has been given a place in mythology. In one particular Asian myth, the salamander, although resembling a typical specimen, it makes its home in fires; the hotter the better. Early travelers to China were shown garments which, or so they were told, had been woven of wool from the salamander: the cloth was completely unharmed by fire. The garments had actually been woven from asbestos. The Swiss physician Johann Jacob Scheuchzer described in 1726 a fossil as Andrias scheuchzeri (Andrias means "image of man"). He assumed that it was a fossil of a human being that survived the Great Flood, and called it Homo diluvii testis (Witness of the Great Flood). The Teylers Museum in Haarlem (the Netherlands) bought the fossil in 1802, where it still is being exhibited. In 1812 the fossil was examined by Georges Cuvier who recognized it as being a Giant Salamander. 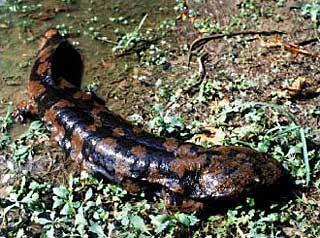 The name of the genus Andrias was used for the Chinese and Japanese Giant Salamander. 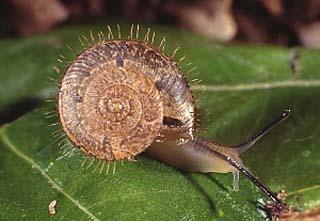 Dlinza Forest Pinwheel (Trachycystis clifdeni) is a Critically Endangered snail known only from Dlinza forest, South Africa. The forest is protected under KwaZulu-Natal Wildlife, however, it is a very small area (only 250 hectares) within an urban location and there is concern that the species may be negatively impacted by extreme stochastic weather conditions and climate change. The Javan Rhinoceros (Rhinoceros sondaicus) is one of the rarest and most endangered large mammals anywhere in the world. According to 2002 estimates, only about 60 remain alive, in Indonesia and Vietnam. Even these tiny populations are still being poached and the outlook for the species is grim. The Javan Rhinoceros occupied lowland rainforests through much of South-east Asia. It is grey in color, hairless, and adults typically weigh up to 1.4 tonnes. Like the closely related larger Indian Rhinoceros, it has only one horn, and in common with the almost equally endangered Sumatran Rhinoceros it is exclusively a browser on leaves rather than a grazer on grasses. Favoured feeding strategies include knocking down saplings to reach the leaves and shoots, and gathering fruit. Status: Classified as Critically Endangered (CR-C2a) by the IUCN Red List 2002, and listed under Appendix I of CITES. 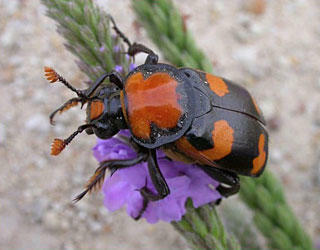 Burying beetles or sexton beetles (genus Nicrophorus) are the best-known genus within the family Silphidae of carrion beetles. Most of these beetles are black with red markings on the elytra (forewings). They bury dead birds and rodents in order to lay their eggs into the carrion. Adults take care of the brood. Burying beetles have large chemoreceptors at the tips of their antennae, capable of detecting a dead animal from a long way away. After finding a carcass (most likely that of a small bird or a mouse), beetles fight amongst themselves (males fighting males, females fighting females) until the winning pair remain. If a lone beetle finds a carcass, it can continue alone and await a partner. 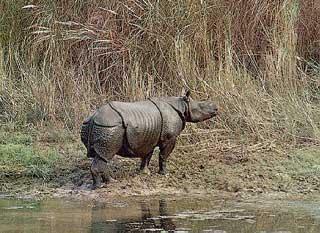 Status: Classified as Critically Endangered (CR - A1c) on the IUCN Red List 2002. 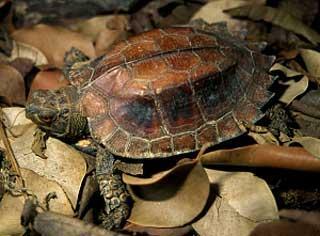 The Keeled Box Turtle (Pyxidea mouhotii) inhabits the forest floor leaf litter of localized areas of evergreen forests from northeastern India through Myanmar, Lao PDR and Viet Nam to southern China. The species has been harvested in large numbers for the Asian turtle consumption trade, as well as for the international pet trade. Populations have disappeared and remaining populations, including those in formally designated protected areas, appear to be declining.